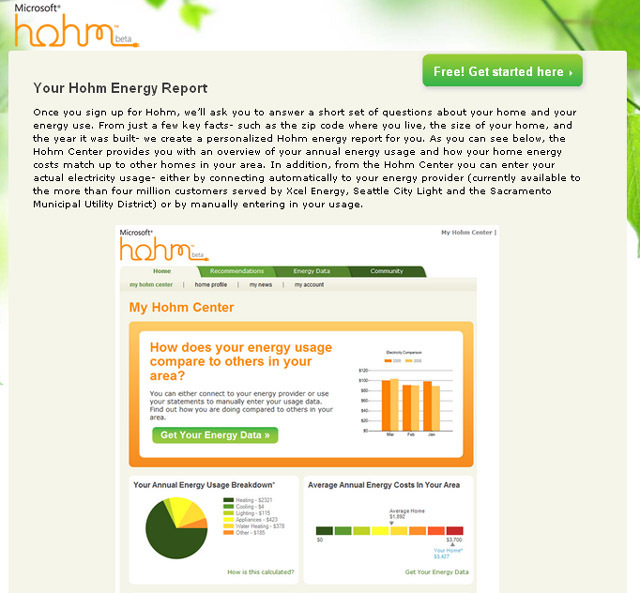 Starting today, more than 60 million homeowners will be able to answer one simple question: “Am I an energy hog or an energy miser?” Microsoft Corp. today announced the availability of the Hohm Score, an estimate of a home’s energy efficiency, offered as part of the company’s free online home energy management tool, Microsoft Hohm. By simply typing in an address at http://www.microsoft-hohm.com, anyone can see the Hohm Score for almost any home in the United States. .......... "------ With new tools and information, homeowners can easily compare their household’s energy use with other homes nationwide ? and see how much they could be saving.